Total value of scholarship: $40,000 over 4 years. The Gongaware Center for Insurance and Financial Services provides four-year scholarships for qualified, incoming Indiana State University freshmen who choose to pursue a career in insurance and risk management or financial services. In its mission to prepare students for leadership roles in financial services careers, The Gongaware Center recognized that the best entry-level positions in the industry are available to our graduates, especially if they distinguish themselves through knowledge, skills, leadership abilities and hands-on experiences. If you choose to study insurance and risk management or financial services at Indiana State, what are your options for a career? For Gongaware Scholars, the world is their oyster. Our scholars and alumni have chosen from a variety of careers, such as accountant or CPA, business analyst, insurance broker, financial analyst, investment advisor, claims adjusters, actuaries, risk managers, underwriters, risk analysts and more. Financial services was added as a major (and minor) in 2007. 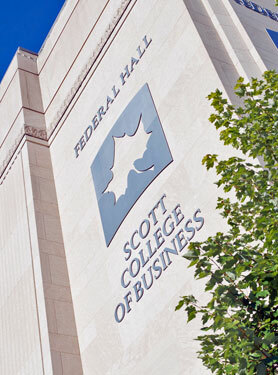 All Scott College of Business students complete a solid business core of courses in addition to courses in their selected major or majors. The major requires all students to complete an overview of financial services with specific course work in the areas of financial institutions (banking), investments, and insurance with a focus on ethical decision making. Your coursework along with the exceptional activities designed specifically for Gongaware Scholars, as part of the Networks Professional Development program, will help ensure you are prepared for a wide variety of career options. Please make every effort to nominate students by November 20 by clicking the “Nominate a Student” button above. Eligible students need to apply to enroll at Indiana State University by December 1. Applications for the scholarship must be received by December 15.